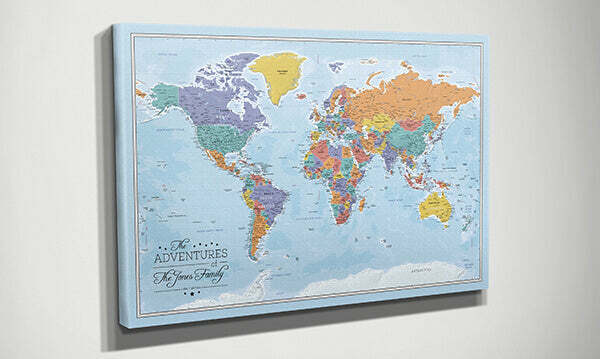 What’s not to love about our Canvas Gallery Wrapped Blue Oceans World Map?! With its vibrant, bright colors and distinctively different look, this frameless world push pin map will liven up the walls of your home, office, or business, while also creating a fun conversation piece. This large gallery wrapped canvas world map has a modern, timeless look that you will be proud to show off to friends and family. All 50 US states are outlined and named so you can easily track your US and worldly travels. Relive your favorite vacation memories with each new pin you add to your map. 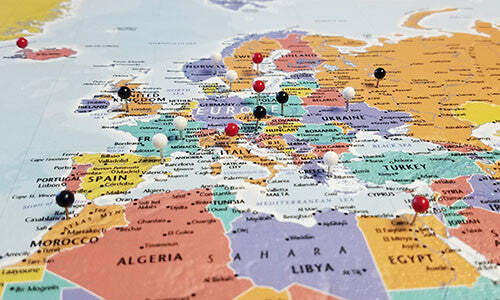 Your world push pin map will also help inspire future travels as you use it to plan out that that next big adventure. Personalize your map by selecting from one of our six unique personalization templates to truly make it your own. Your personalization will be printed directly on the map itself in the lower left hand corner. Push Pin Travel Maps make a special gift idea for weddings, anniversaries, birthdays, retirements and more! 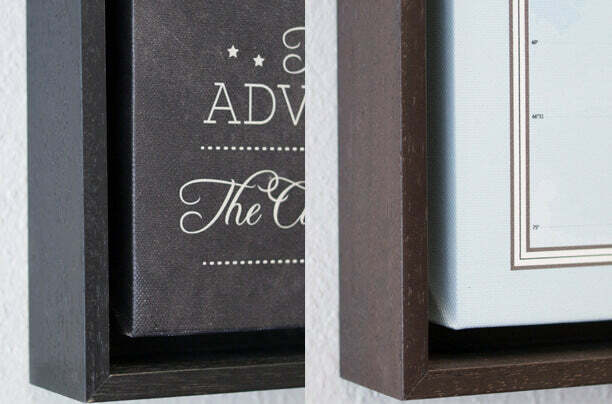 If you're looking for the same map, except with a more classic feel, check out our framed Blue Ocean World Map. We ordered the Gallery Wrapped Blue Oceans Map with the black float mount frame. It is beautiful, we couldn't be more pleased. It is very well made, sturdy yet light weight. The company replied quickly to my questions, and sent me a proof of the personalization. Service was fast, I had the map in 1 week. The personalization is perfect. I highly recommend Push Pin Travel Maps! I was amazed by the quality of the map and it made a perfect gift for my wife to keep track of all the places we have been. Love my new world map. The canvas wrap is ideal for a way to show the world traveling you've done while planning for your next trip. very happy with this map I ordered as a gift. It was very well received and appreciated!